A few weeks ago I received an email from Packt Publishing asking if I’d review a new book that had been written on Firebug. I’ve seen books written on Firefox and on Firefox add-on development, but this is the first book entirely about an add-on that I’ve come across. Throughout all of the chapters is a detailed guide to the Firebug console and how valuable it is in non-obvious ways. The book finishes up with suggestions and reviews of 8 extensions to Firebug like YSlow and Firecookie, and then with a brief chapter on how to write your own extensions to Firebug. 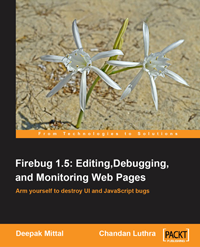 Overall, this book will be helpful to anyone just getting started with Firebug, as well as anyone familiar with Firebug who wants to hone their skills and learn about everything it can do.